Over the years, your home or office can become cluttered as you accumulate more and more stuff. Before your building becomes filled to the brim, allow the experts of Payless Storage to de-clutter your space and keep your belongings under their careful supervision. With four convenient locations spanning Texarkana, TX, Texarkana, AR, and Shreveport, LA, your ideal standard or climate-controlled storage unit is closer than you think. From storeroom-size units to RV and boat storage, Payless Storage is devoted to providing each customer with a safe space for even the most high-maintenance goods. In addition to their wide range of available storage units, Payless Storage doubles as a certified U-Haul dealer, so you can rent a truck, trailer, or car hauler to safely bring your things into a storage unit. Forgot to stock up on packing supplies? The storage center has all bases covered with a complete selection of boxes and packaging equipment. At Payless Storage, you’ll never be burdened with deposits or high rental prices, and each unit is available for month-to-month leasing that fits the busy and unpredictable tendencies of modern life. With regular security patrols, fenced perimeters, CCTV systems, alarmed units, and computerized gates with personal access codes, this storage facility makes safety its number one priority. Though they’re tough on unannounced visitors and demand security screening for all staff members, Payless Storage won’t let their precautions get in the way of your convenient 24-hour access. If you ever have an emergency, the dedicated storage company even offers a 24/7 service hotline, so you never have to feel like you’re on your own. 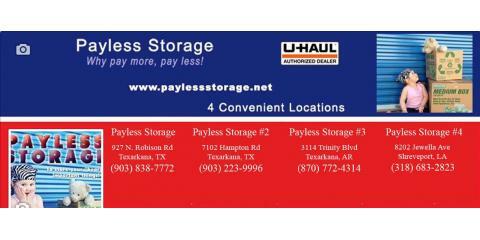 With a range of comprehensive services and an emphasis on customer satisfaction, Payless Storage is the number one storage company in the Texarkana area. To learn more about their facilities, call (903) 838-7772 or visit their website.